You almost expect to hear squeals of "Look! Dinosaurs!" the moment they appear. Indeed, so fascinating are the pair of reptiles who constitute half the onstage personnel in Remy Bumppo's production of Seascape that at one performance, an ostensibly adult theatergoer, finding herself in close proximity to one of the scaly beasts, couldn't resist trying to pull on its tail. These saurian personages are not cuddly kiddie-show fauna, however, but dignified participants in Edward Albee's somber symposium on evolution, civilization and survival. This means that costume designer Rachel Laritz must reverse centuries of skeletal development in adapting human physiology as we know it to prehistoric anatomical structure. To begin with, lizard tails are extensions of the spine and, as such, must move in alignment with the actors' torsos. This, in turn, makes for arms and legs spraddled in almost-prone posture. (Imagine doing push-ups in spread-eagle position.) All this must be accomplished without excessive strain on the performers' own backs, while still permitting them the lightning-strike mobility characteristic of their species. Laritz first addressed the issue of the tails, which are not as heavy as they appear, but can stretch to nearly six feet when fully extended. "The tails are anchored to a canvas harness reinforced by webbing in the back and heavyweight spandex in front—like a very tight-fitting pair of briefs—as well as to thigh-straps and suspenders to help distribute their bulk. After those are in place, the actors put on their body-suits, which are then snapped and hooked to the tails." Those tails look so solid—what gives them their heft? "Basically, foam, with a tunnel of plastic beads on the bottom, like you find in Beanie Babies." Laritz recalls that during the planning stages, she and Harlan Ferstl, the production's draper, visited a foam-manufacturer to review their options as regards materials. "We wanted something buoyant and lightweight that we could shape to our desired purposes, and that would move on its own, even after the actor has stopped. So not only did the actors wearing them have to learn to navigate around them—as you would with bustles or panniers—but so did the other actors onstage as well." Acclimating to this cumbersome silhouette is not a skill quickly acquired. "They had the tails on as early as the second week, as soon as they had finished their tablework and were on their feet, after which they had three weeks in the rehearsal room and one in the theater during tech. What proved more challenging was the low/wide stance on all fours, with their wrists constantly bent and their weight resting on their inner knees in order to allow the tail to continue in a straight line, instead of curling upward, as it would if they crawled like humans do." This is without counting makeup, head coverings and "underwear"—actually athletic foundation garments and compression gear. What's the remedy for aches and pains? "Yoga stretches. Epsom baths. They also wear wrist braces, knee pads and ace bandages. Oh, and unfortunately, no bathroom breaks after they're in their tails and skin." she adds in tones of regretful sympathy, "Not once they're armored up under all those layers." 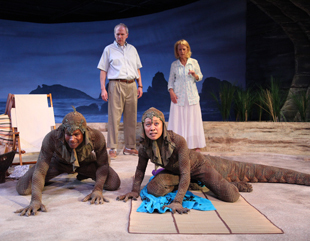 Remy Bumppo Theatre's production of Seascape runs at the Greenhouse through October 14.